Three big names have joined forces to make your grocery shopping even more worth it. 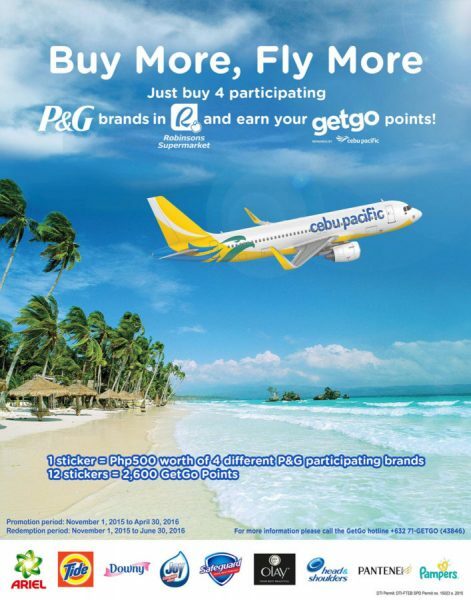 Robinsons Supermarket, P&G and Cebu Pacific’s GetGo lets you fly more when you buy more! Every P500 purchase of at least four participating P&G brands in Robinsons Supermarket earns shoppers one travel sticker. After collecting 12 stickers, shoppers will be given a GetGo Card worth P150 for free. The card upon activation will be loaded with 2,600 GetGo points. 2600 points is equivalent to a one way-trip to Cebu. Buy More, Fly More is exclusive to Robinsons Supermarket and the following P&G brands: Safeguard, Olay, Head & Shoulders, Pantene, Pampers, Ariel, Tide, Downy, and Joy. With this campaign, P&G takes its purpose of touching and improving consumers’ lives to new heights—now, shoppers have a chance to fly with their P&G purchases!